I am running a 2 day sound healing workshop to align to the Divine Love Matrix. We are living in a very auspicious time where the energy of the flower of life/Metatron cube is being assimilated into our energetic being on a very deep level. This workshop is to help us fully integrate and connect to this wonderful energy. When we are in alignment with this matrix we are in alignment with all our divine pathways and the Universe has to offer. 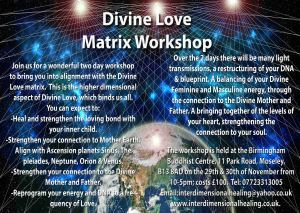 In this workshop we will be working on developing a temple of love and peace within ourselves. Working on healing and developing a loving relationship with ourselves and the Universe around us. You can expect to: -Heal and strengthen the loving bond with your inner child. -Strengthen your connection to Mother Earth. -Align with Sirius, The Pleiades, Neptune, Orion & Venus. -Strengthen your connection to the Divine Mother and Father. -Heal emotional and physical issues. -Cut cords from the past. -Reprogram your energy and DNA to a frequency of Love. -Feel at one with the Universe. -Connect and bring into alignment the lower and higher aspect of your heart. -Strengthen your connection to your soul. -Feel happier and loving in yourself. -Integrate the energies of the flower of life/Metatron Cube. 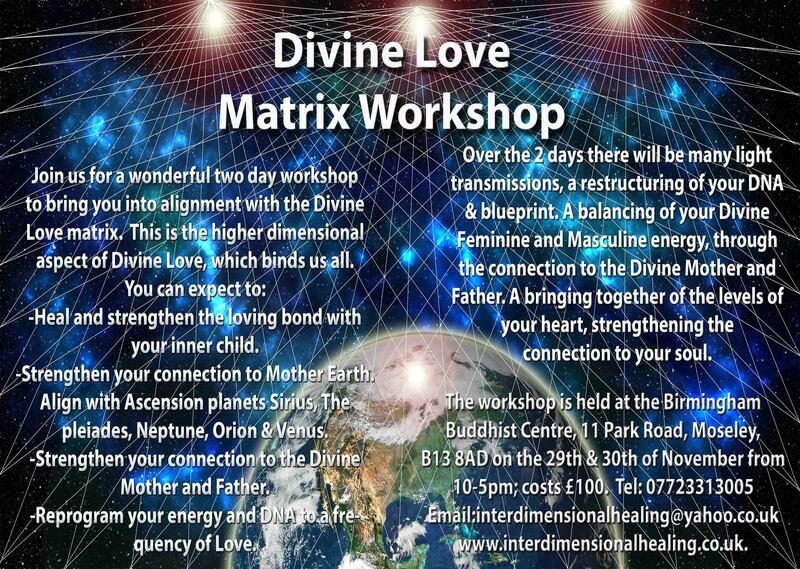 There many beings who work with the Divine Love Matrix and over the two days we will work with these amazing beings to develop a strong connection to this. There are Angels, Ascended masters, beings from the Pleiades, Neptune, Sirius, Venus and Orion. Each one brings their own unique gifts and essence to maintain this matrix. Various techniques and meditations will be used along with 11 crystal singing bowls and tuning forks to create this healing and transformational weekend. The workshop will be held at the Birmingham Buddhist Centre, 11 Park Road, Moseley, Birmingham B13 8AB. This is on the 29th & 30th of November. The Buddhist centre is a divine and sacred space. Perfect for the transformations you will go through over the weekend. We are in the main shrine room here is a link to look at the venue http://www.birminghambuddhistcentre.org.uk/?page_id=32. There is a space to relax and eat during out breaks and even a beautiful garden to visit if you choose. This is also the weekend of a very powerful new moon which will give us even more opportunity to get ourselves in the right space for bringing into our lives that which we truly deserve.